This new version of TwinTeeth is almost made with aluminium parts. 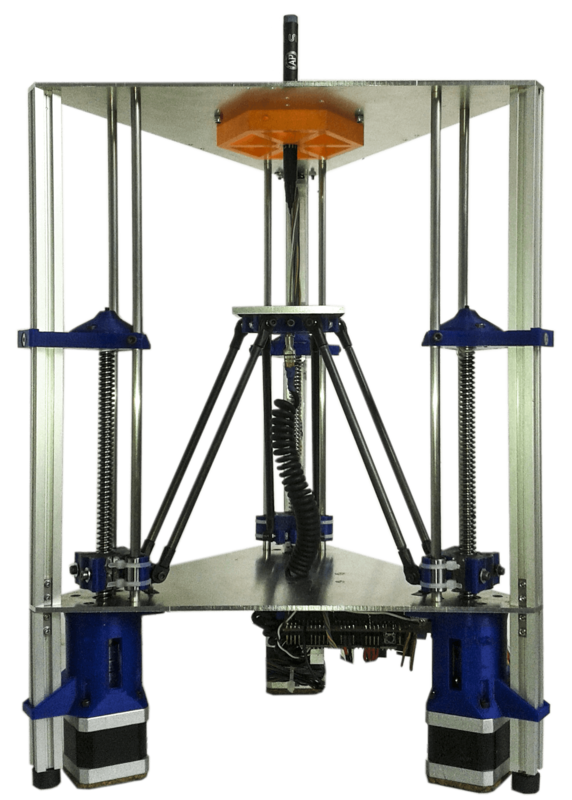 We designed a new framework using Mecaduino: a construction system based on 15x15mm aluminium extrusion. It allows interconnecting multitude of accessories with an incredible versatility. The special parts available in this kit are easier to assemble than in previous version. 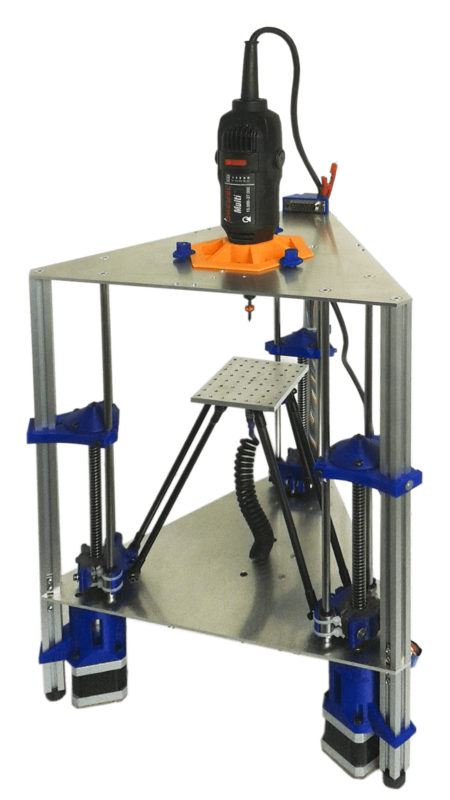 It includes all the materials needed to assemble the framework and you only have to add the motors, wiring and the Arduino electronics. Aluminium triangles - Last version big vertex plastic parts have been replaced by 3mm aluminium sheet triangles. These sheets are CNC milled with precision and are ready to use. They include all the drills, countersunk holes, the hexagonal pocket and sockets for the end-stops micro-switches. Aluminium columns - The 20x20mm aluminium tube used in previous version were replaced by 15x15mm solid aluminium extrusion which provides more robustness to the framework. They are already cut, drilled, threaded and ready to install. Linear guides -The kit includes new 6mm stainless steel rods cut, drilled and treaded with precision on both ends to easily install them on the triangles. ToolHead retainers - We simplified the method to install the ToolHeads on the robot and we designed a new retainer knob. We also included a new border on the hexagons which helps to seat them on the triangle. With these modifications is easier and quick to interchange the various ToolHeads supported. 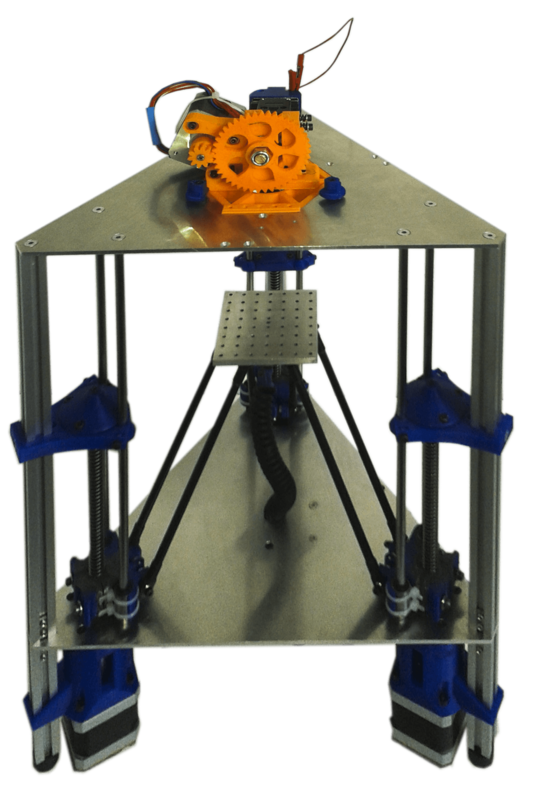 Adjustable legs - Using 15x15mm aluminium profile, we designed and include in the kit new legs which add robustness to the framework. They are threaded on one end to install adjustable feet also included in the kit. 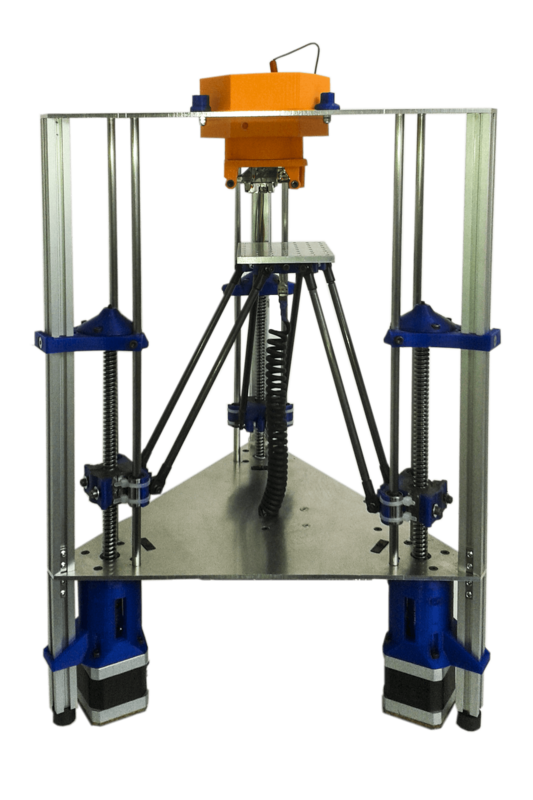 Lead-screw system - This version comes with the improved linear motion system based on 200mm lead-screws which provides more precision and accuracy to the robot, eliminating at the same time possible lead-screw wobbles. Now you can choose between two models: TwinTeeth Basic and TwinTeeth Plus. TwinTeeth Basic is almost made with 3D printed plastic parts and it is your best option if you own a 3D printer. 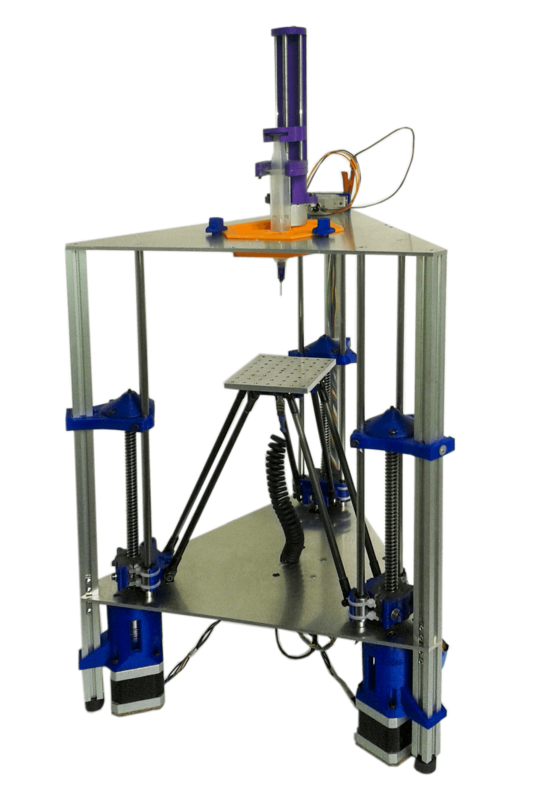 TwinTeeth Plus is almost made of aluminium parts although it has some plastic pieces.This is your best option if you don't own a 3D printer or if you prefer a robust aluminium framework easy to build. Al the ToolHeads are compatible with both versions and the firmware/software is also the same for both models. The rest of the tutorial is shared with TwinTeeth Basic. You can access it on the Build It page. Both models share the same calibration and operation procedures. TwinTeeth plus is an open-source project for both: hardware and software. 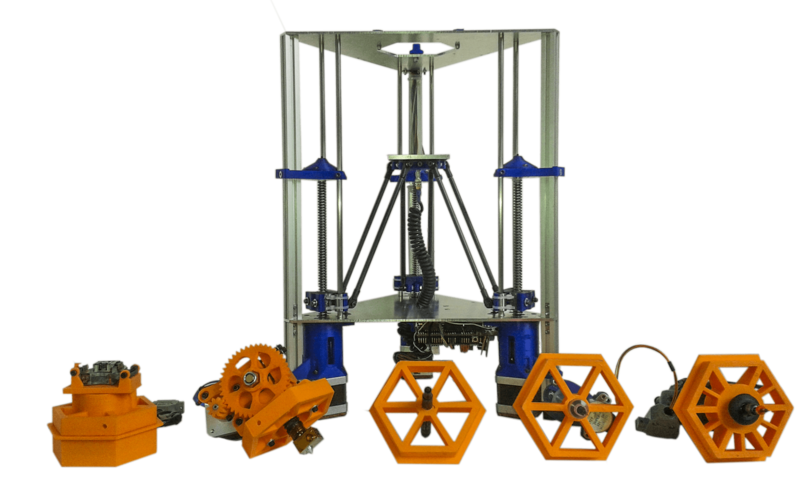 You will find here all the blue-prints, 3D printed parts, electronic schematics and source files. Check also the Get it section of TwinTeeth Basic where you will find additional information. We have designed and tested TwinTeeth Plus with much effort in the hope that it will be useful to the community, but WITHOUT WARRANTY OF ANY KIND; tacit or implicit to no particular purpose.